Yesterday, Sunday, September 28, 2014, will be a day forever etched in my mind and the minds of thousands – even millions – of fellow Yankee fans, and a bittersweet day in baseball history: it was the final game in the storied 20-year career of Yankee shortstop Derek Jeter. What can I say about Derek Jeter that hasn’t already been said about him by countless others, especially over the last few weeks as this season, and thus his career, grew closer to its end? What can be said that hasn’t already been said over the last few days, since he did the unthinkable (except, as it’s Jeter, was it really THAT unthinkable?) and turned his final Yankee Stadium at-bat into a walk-off win. I AM NOT SLEEPING TONIGHT. THANKS DEREK. LITERALLY THE MOST DEREK JETER MOMENT EVER. 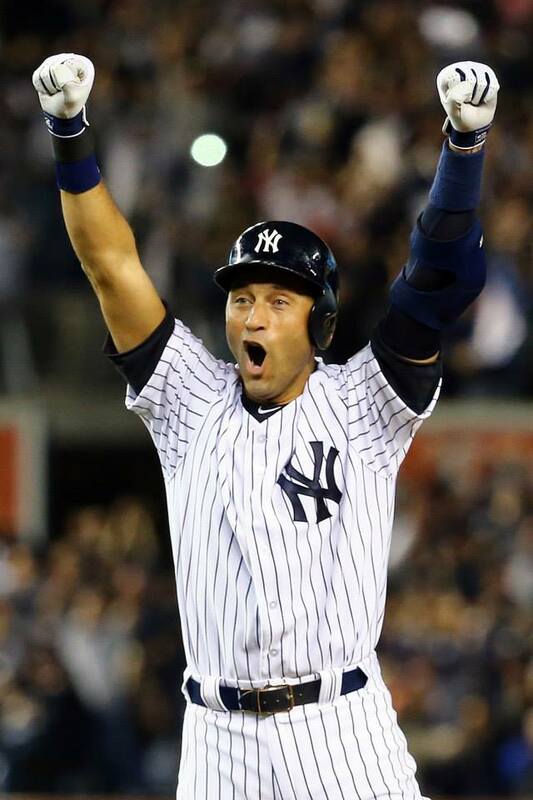 The home run for HIT NUMBER 3000; Jeter ends his career with 260 home runs and never hit more than 24 in a season. HOW could he be only the 2nd player out of the 28 to reach the milestone to do this, especially when 4 of them also hit over 500 home runs? THE DIVE against the Red Sox in July of 2004, still the greatest game I have ever seen. If I remember correctly, he played the next day against the Mets. His game-winning home run in the 10th inning of Game 4 of the 2001 World Series, just 2 months after the September 11 attacks, that tied the series at 2 and earned him the name MR. NOVEMBER. The fact that he won 4 WORLD SERIES before the age of 27. I just got goosebumps writing that sentence. Derek Jeter, one of the most stoic, most selfless, and classiest players of his generation, and one of the greatest leaders in sports, especially evident when compared to the antics of the Ray Rices, Ray Lewises, Ben Roethlisbergers, and Alex Rodriguezes of the athletic world, will sorely be missed.